The Happy Smiley Writers Group is a group of seven writers located in Singapore. Through their Two Trees Pte. Ltd (http://twotrees.com.sg/books.html) micro-press they have published three science fiction anthologies since 2009. 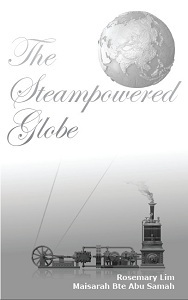 Their latest, The Steampowered Globe (ISBN 978‑981‑07‑0549‑7, SGD$18), is a steampunk anthology. Part of the surprise comes from the collection’s very existence. Literary steampunk from Singapore? Obviously, there are a number of science fiction writers in Singapore and more generally in Southeast Asia, but nearly all of the steampunk short stories and novels published so far are from Western writers. I thought The Steampowered Globe would be an excellent opportunity to discover how Southeast Asian authors viewed steampunk and wrote it, and what the differences might be between steampunk written in the West, from descendants of the colonizers, and steampunk written in the East, from descendants of the colonized. the state of steampunk in Singapore is still budding…mostly people are exposed to it due to video games and books. Besides online influences, cosplay conventions are one way to spread what steampunk is for all the subculture fashions appear in them. For the writers in this anthology, some of them knew what steampunk was while others just read our explanation and references on what it was in our submission call page. We placed that at the back of the book because depressive endings with angst‑ridden misery is prevalent here in local (Singapore) publishing. The bestsellers tend to be depressive woe is me cultural stories. It would have been okay if it wasn’t just that but there you go, we wanted an anthology that was a smack in the face to show that genre fiction exists besides literature texts. This anthology was to prove that yes, there are writers here who write science fiction, steampunk or genre fiction and that it is okay to write that. It is difficult to publish genre fiction here as people don’t think it is commercially viable or that no one wants to read them since they’re not assessment or text books. What were the results? A 144 page, seven story anthology with a high rate of success—high by any standards, not just those of a writers group micro-press anthology. The fact that so many of the stories succeed is a tribute both to the Happy Smiley Writers Group and to editors Abu Samah and Rosemary Lim. – continue reading or buy a Kindle edition of the book!